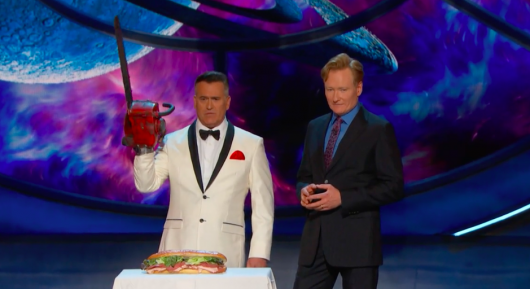 Bruce Campbell made an appearance on Conan on Thursday night where he cut the host’s sandwich with a chainsaw Evil Dead-style. Watch the video of Campbell’s appearance here below! Since moving out to California, Conan O’Brien has used the annual San Diego Comic-Con as an excuse to go buck wild with his late-night talk show Conan on his new cable home on TBS. 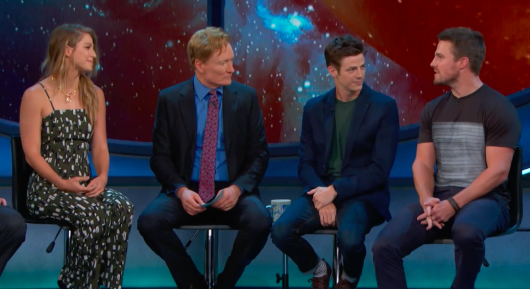 For Thursday night’s SDCC show while hosting the stars of the CW’s new superhero primetime lineup — Stephen Amell (Arrow), Grant Gustin (Flash) and Melissa Benoist (Supergirl) — O’Brien needed a boost of energy to deal with all the star power there. To get a quick fix, he was delivered a sandwich by the backstage crew, but the sub was too long for normal human consumption. Fallout 4 was officially released today (read our review right here), making today a holiday for many gamers. As part of his late night talk show Conan, host Conan O’Brien, who is not a gamer, does a segment called “Clueless Gamer” in which he plays (or attempts to play) various video games with a little help from someone who knows what they’re doing, Aaron Bleyaert. 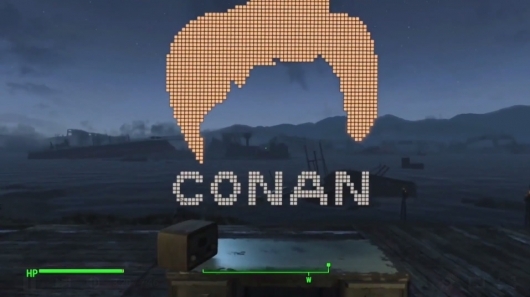 So for the latest session it made all the sense in the world for Conan to take on Fallout 4. They even built an awesome Fallout inspired set and donned some skintight Vault-Tec vault 111 jumpsuits for the segment. You can watch the video of O’Brien taking on the Commonwealth wasteland below. Last night, TBS aired the “Conan In Cuba” special oversized episode of Conan, which documented host Conan O’Brien‘s historic trip to Cuba to become the first late night host in 50 years to film a show in that country. The network has released a bunch of highlight clips from the episode, which saw O’Brien dancing and interacting with the people of Cuba, as well as visiting a rum museum and making Cuban cigars. Watch all the videos here below. 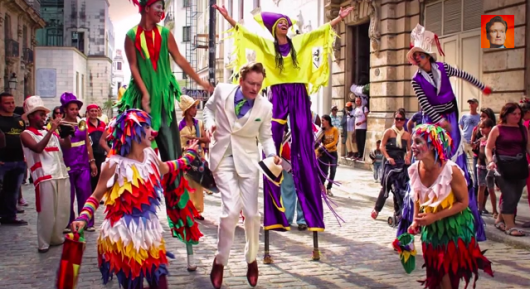 Conan O’Brien became the first late night host in 50 years to film a show in Cuba, when he and his Conan crew visited the city of Havana earlier last month during the long Presidents’ Day weekend. 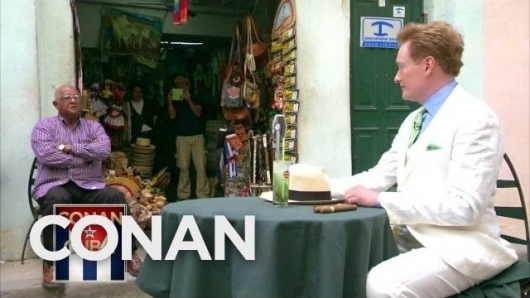 Now, on Wednesday, March 4, 2015, the “Conan In Cuba” special will air on TBS for all to see. The Conan show has released a 90-second preview of the special, which you can watch here below. Conan O’Brien spent the long Presidents’ Day weekend in Havana, Cuba, where he filmed a special episode of his late-night talk show Conan. The red-headed comic posted to his Twitter account on February 16, 2015 that he had spent the previous four days shooting footage for his TBS show all around the city of Havana for an upcoming special called “Conan In Cuba,” airing on March 4, 2015. 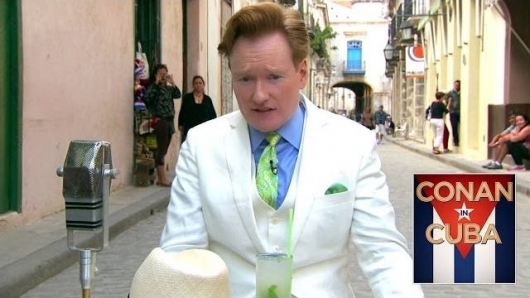 On Tuesday night’s episode, which saw O’Brien back in the States, the host revealed a photo of himself in a white linen suit joining in with some colorfully clad street performers in the streets of Havana in what he swears was not a staged moment. Check out the photo here below of Coco dancing in the streets, as well as one of him posing in front of a car, along with his posts to social media and a video of him talking about the experience. Once upon a time, a long, long time ago (a handful of years, anyway), no one knew what this show HBO was making called Game of Thrones was going to be…apart of course from those who had read George R.R. Martin’s A Song of Ice and Fire books and had their own high expectations for what it should be. This includes Amanda Peet, who currently stars in the new HBO dramedy Togetherness, and whose husband, David Benioff, is one of the co-creators of Thrones. Appearing on Conan recently, Peet admitted that when she first heard her husband’s plan to adapt the books into a series, she thought it was a “terrible idea.” Now that the show is a few seasons in, however, she’s just as addicted to it as the rest of us. You can see a video of Peet’s confession here below. When the Oscar nominations were announced on Thursday, one of the most obvious snubs was for The LEGO Movie, which was left out of the running for Best Animated Feature. Internet outrage (justifiably) ensued. The film’s co-director Phil Lord took to Twitter to try and calm the masses, and even posted an image of a LEGO version of the Oscar statue to show everyone that he had made his own. 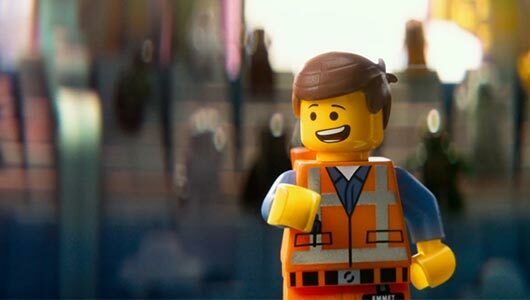 But, are the people behind The LEGO Movie really going to be such good sports? Conan O’Brien doesn’t think so, as the late night talk show host posted a video of the “response” from the producers of The LEGO Movie regarding the Academy’s failure to nominate the film. They seem pretty pissed. Watch the hilarious video here below. 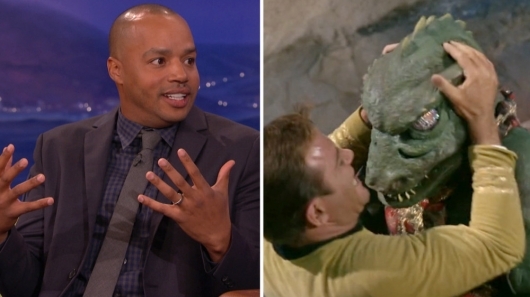 It’s an age-old rivalry – Star Wars vs. Star Trek and actor Donald Faison has brought it back into the arena. The Scrubs actor, a self-professed Star Wars fanatic, made an appearance last week on Conan to promote his latest film, Let’s Kill Ward’s Wife, which is out now On Demand and in select theaters in NY and LA. During the appearance, he talked about celebrating this 40th birthday at Disneyland, where he donned a Darth Vader helmet hat. This led to a discussion about Star Trek and how Faison feels it’s “lame” in comparison to Star Wars. To prove his point, the actor brought a clip from the original Star Trek television series episode “Arena” where Captain Kirk (William Shatner) fights the Gorn. Check out the video of Faison’s Star Wars vs. Star Trek appearance here below.